For The Birds is one of my favourite audiobooks. It has a great story with a number of twists and red herrings to the mystery. This is coupled with some of the most entertaining characters in a majestic setting. I never expected my favourite character to be a bird named Ruby but she is delightfully sassy. This quirky mystery with a senses of humour should be on everyone's TBR list. I can't wait to read the whole series. 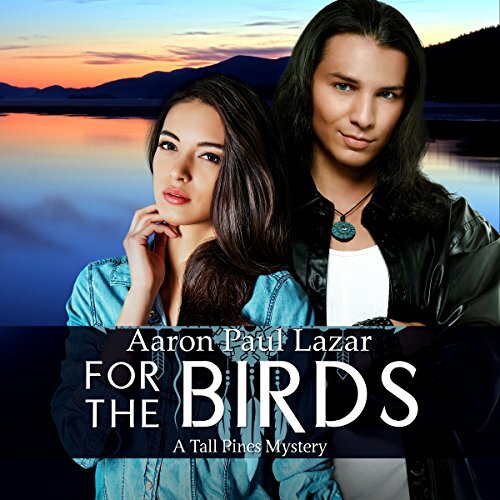 If you could sum up For the Birds: A Tall Pines Mystery in three words, what would they be? What was one of the most memorable moments of For the Birds: A Tall Pines Mystery? I really liked the surprise reveal about one of the main characters (no spoiling here!) and thought the ending was a fitting, satisfying one. Which character – as performed by Hannah Seusy – was your favorite? It's hard for me to say--no character stood out for me although I would have to say I enjoyed Ruby the most. Actually, the character I most enjoyed was the posthumous character of MArcella's dad. You know, I was surprised at hpow much I enjoyed this book. It had a slow start but ramped into a sweeet and engaging story. I'm a fan of Aaron Paul Lazar's Gus Legarde series. This is the first of his other books I've read. Right from the opening pages, I really appreciated the quality of his writing--narration and dialogue were spot on. Lazar gives this story the rich setting details he's famous for (well, if he isn't yet, he should be!) plus an even more engaging lead than Gus Legarde (and that's saying a lot). Marcella Hollister and her supporting cast of zanies offer loads of raw material for the series. As for plot, Lazar delivers a kooky sequence of events with a well-developed showdown with the villains. Then the story slowed down. I was thinking with furrowed brow, Hmmm... this is a bit of an anticlimactic tail-off ... Then Lazar sucker-punched me with a twist you'd have to be really psychic to see coming, and then a final zinger to wrap things up. This is a fun light read (listen, in my case), but it contains occasional glimpses of very poignant subtext--another signature feature of Lazar's novels that make him one of my favorite up-and-coming authors. This is also the first time I've heard Hannah Seusy's narration. To be honest, my first reaction was that her diction lacked clarity. But within a few minutes I got into the swing of her voice and ended up being completely won over by her outstandingly natural characterization of not only Marcella but also the other characters. Two thumbs up, all around. I am one of Aaron Paul Lazar's happiest fans. I have listened to almost every book he has written. This is my first in the Tall Pines series. I so enjoyed the entire story. When I listen to one of Aaron's books I feel as if I am part of the actual story. The characters in every book are so real and &quot;down to earth&quot; for the most part but I have to say some of them manage to experience life in a way that is unusual. That's what makes such a good story though...experiencing life vicariously through these exciting and romantic characters. I was given this book by Aaron in exchange for a review. This book did not fail to satisfy my interest in his stories. I had no idea how this story was going to end. A young couple and her Mom and a talking bird traveling in a van to a bird show ! Twists and turns take the listener to places one would never expect. Don't miss this one !! Thanks Aaron !